Bethesda recently had a great “find” that no one could have anticipated or expected. For the past four years, Bethesda's Watertown campus has been undergoing a major renovation project in an effort to provide the individuals with developmental disabilities who live there a more independent living environment. Part of this reconstruction process involved the razing of a building that had been a staple on the Watertown Campus for nearly 50 years - the Ritter building. Through the years, the Ritter building served many purposes for the Bethesda organization. In its infancy, the Ritter building served as a residential building where individuals would live. As more individuals moved off the Watertown Campus to apartments and group homes in communities throughout the country, the Ritter building was transformed to become an office building for various departments that were making up the ever-growing j organization. In 2003, many of the departments that occupied the Ritter building moved to the newly-constructed corporate center that was built just across the Watertown Campus. As a result, preparations were made for the building’s razing, which involved a lot of time and effort from the materials management department, headed by Rod Jacobson. All the old office furniture, lighting, artwork and everything imaginable had to be either sold or disposed of to make the building ready to be taken down. In an effort to help the process, Bethesda sponsored sales where staff members could buy various items throughout the building. The effort helped, and the Ritter building soon began to empty as the time neared for its demolition. During this process, however, one particular item garnered more than a little interest from Bethesda staff members. Rod Jacobson, who serves as director of materials management, reported that a lot of staff members were interested in an oil painting that was found hanging in a basement stairwell in the Ritter building. Jacobson went on to say that he took several digital photos of the painting and sent them to Howard Rehs of the Rehs Galleries, Inc. in New York. Rehs Galleries, Inc. is one of the world's leading art galleries specializing in important 19th and 20th century works of art; with a particular focus on artists that exhibited at the Paris Salons and London's Royal Academy between I860 and 1920. What he heard back from Rehs Galleries could not have been expected. "To get a proper appraisal, however, Jacobson carefully shipped the actual painting to Rehs Galleries, Inc. What Rehs Galleries found was that the painting was in remarkably wonderful condition, with only a few small areas that needed to be restored. What was more remarkable was that they determined their initial appraisal to be too low. Rehs Galleries came back and appraised the current value of the painting at $32,500. Where it came from and how it came to Bethesda, however, still remains a mystery. After looking into the matter, Jacobson believes that it was donated to Bethesda many years ago, and has been in the organization's possession ever since. A masterpiece that simply remained undiscovered up until the demotion of the Ritter building. The artist, Henry John Yeend King, was an important Victorian genre and landscape artist. His specialty was scenes of rustic genre and the countryside. 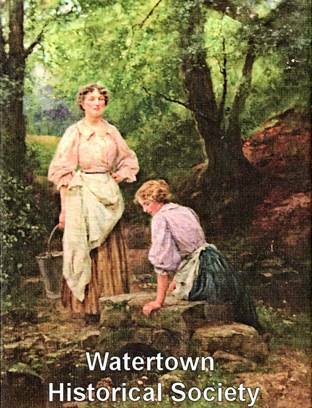 His paintings depict pretty farm girls at work in the fields or on the farm, or women at rest in tranquil landscapes or cottage gardens. In 1879, King, who was a native of London, was elected to the Royal Society of British Artist (RBA) and in 1886 he was elected to the Royal Institute of Painters in Watercolor. He was also a member of the Royal Institute of Painters in Oil-Colors and was a frequent exhibitor at all the major exhibition halls throughout Europe and the United States. It was at a Royal Academy exhibit in 1897 that the Council of the RA purchased “The Garden by the River” and in 1898 the Tate Gallery purchased “Milking Time,” cementing King as one of the most important and influential artists of his time. It is still unclear as to if and how Bethesda will display this wonderful painting, but if and when it is, you can rest assured that it will be somewhere a little more prominent than it was before.